Welcome to Blue Jeans Cable's UK and International ordering website. Blue Jeans Cable ships worldwide -- and to most destinations we ship via Federal Express International Priority service, with customs fees and duties pre-paid, so that you receive your cable shipment promptly and without the need to pay unexpected charges. Blue Jeans Cable now offers a unique enhancement to our speaker cable line: ultrasonically-welded banana plugs. Where conventional banana plugs are applied to cable by setscrew or compression-screw methods, our locking bananas are now welded directly to the copper cable for the best in high-strength, low-resistance bonding. To read more about this process, see Ultrasonically-Welded Speaker Cable at BJC. As a general rule, HDMI cables are nearly identical to one another in their internal structure. Blue Jeans Cable offers the only cables on the market with a fundamental structural difference: the BJC Series-1 and Series-F2 Bonded-Pair HDMI cables. One of the dirty secrets of HDMI cable manufacture is that the vast majority of products are simply rebranded Chinese-made cable stocks and assemblies. The BJC Series-1 and Series-F2 are the exceptions to that rule: the bulk cable is manufactured in the USA, using Belden's patented bonded-pair technology for superb impedance stability, low return loss, and better reliability over distance; only the connectorization is done in China. The high quality of the BJC cables is attested both by our longer-than-the-competition HDMI testing certifications and by in-use experience; we have run 1080p video in the Series-1 cable 125 feet without information loss, with no booster or EQ unit required. Need something more conventional, at a bargain price? See our Tartan HDMI Cables -- there's nothing wrong with Chinese cable as long as you get it at a made-in-China price! Questions about HDMI cables? 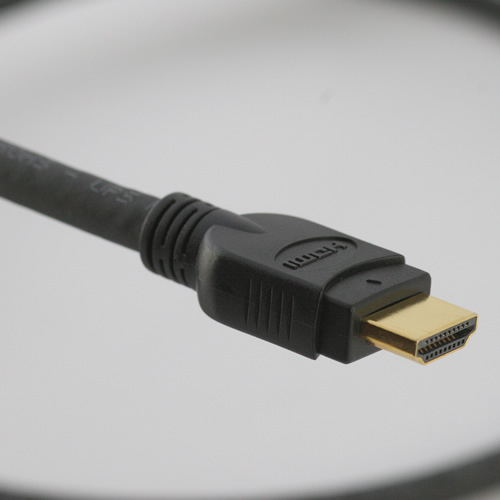 Our HDMI Cable Information Center provides the most detailed information on the web on every aspect of HDMI cabling. We are not merely a reseller of HDMI cable--we are licensed as a full-fledged HDMI Adopter.